There is a viral video spreading across social media platforms called Kony 2012 created by an organization known as Invisible Children. Just released on Monday, March 5, the video has already passed 75 million views on YouTube. This is a phenomenal reach for a video on the long side (30 minutes) about Joseph Kony a Ugandan war lord, that until now American audiences had demonstrated little interest in. The viral video has been amplified through reports at major, mainstream news outlets in the U.S. A week into its existence, the video campaign has even been spoofed by Jon Stewart on The Daily Show. There have also been some scathing critiques and reactions against the #StopKony campaign. Ethan Zuckerman has an excellent post, “Unpacking Kony 2012” that details many of the problems with the video, including that the film gives Ugandans little agency in determining their own destiny. Sarah Wanenchak wonders whether any viral video will necessarily be as overslimplified as this one is. For those that are interested in the mechanics of how this organization was able to pull off this viral campaign, there’s some fascinating data at SocialFlow (the key: pre-existing networks established with Christian youth). What none of these excellent analyses examine, however, is the role of whiteness in the Kony 2012 phenomenon, and I want to focus on that aspect here because I think it’s central to the viral video’s appeal. Obscured in this image is the photograph of Joseph Kony (just out of frame to the left). The image that’s visible is Jacob Acaye, a former child soldier in Uganda. 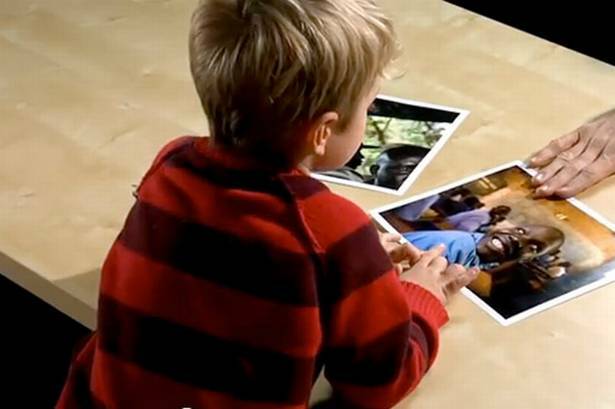 The adult hand holding the top of the photograph is the boy’s father and the filmmaker, Jason Russell. Throughout the film, we meet Jacob several times, and he is described as “a friend” by Jason and his well-coached son. In some ways, Jacob drives the action of the film as it is the promise that Jason Russell makes to him (to “make it stop”) that propels the rest of the video. It’s this moment, and the image here, that carry the central message of the film, and it has much to say about “whiteness.” It is, in effect, a white savior film with social media added in. This film is, (as Richard Dyer argues about another film) “organized around a rigid binarism: with white standing for modernity, reason, order, stability and black standing for backwardness, irrationality, chaos and violence” (1988:49). The added dimension of social media also gets coded as constitutive of whiteness. As the voice over narration in the video observes, “we’re living in a new world, a Facebook world.” And, this new world is going to “stop” the atrocities of the “old, primitive” world. You see this throughout the video in the large crowd shots of the young people involved in the ‘Invisible Children’ campaign, who are almost universally white, are presented as the image of the ‘new, Facebook world’ intent on saving Africa. This is a deeply ironic claim given the importance of mobile technology throughout the continent, often at rates that out-pace the U.S. The absurdity of this is playfully skewered in the “First Day on the Internet Kid” meme (“Share Kony Video, I Fixed Africa”). Yet, the more serious implications here are the ways that this kind of white racial frame is rooted in colonialism. The notion that Jason Russell – a white, heterosexual, American man – is going to “stop”and “fix” the problems in Uganda ignores the work already happening there in favor of a white-led campaign advocating military intervention. One of the moments the video portrays as a victory #StopKony campaign is the order by President Obama to send troops to Uganda. The iconography of (predominantly white) U.S. troops with “boots on the ground” in Africa, flying an American flag conjures the very essence of colonialism and whiteness. The Kony 2012 video’s binarism is, in the broadest sense, racist but not in the narrower sense of operating within a notion of intrinsic, unalterable, biological differences between groups of people (Dyer 1988:51). There is also a strong theme of evolutionism in the video as well, that the, good, liberal whites portrayed in the video are charting a path of progress that is potentially open to all. The video takes pains to draw a distinction between the “bad African,” Joseph Kony, to save the “good African,” Jacob Acaye, who we learn aspires to be a lawyer (as in the image above). Jacob, unlike Joseph Kony, is portrayed as reasonable, rational, humane, and liberal. White viewers are invited to root for (if not identify with) Jacob Acaye, and in so doing, the film positions itself as ‘white savior’ of this young man and the other children he represents. Kony 2012 is, then, an endorsement of the moral superiority of white values of reason, order, and now social media against the supposed chaos and violence of Africa.